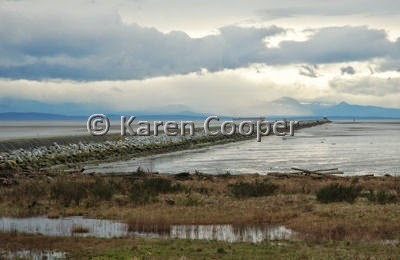 Iona Beach Regional Park is located in Richmond, BC, Canada adjacent to the International Airport. An easy drive from Vancouver, literally a few minutes. And well worth the time to spend a few hours here exploring this restored habitat. There is a Wastewater Treatment Plant here, and the jetty (pictured) is atop part of the plant. I don't know what part of the plant, big round pipe thingees, better not to know. Makes for easy, flat walking for an 8 km return trip. Wear good walking shoes and clothing suitable for windy weather. This marsh area was restored in the 1990's to attract the migratory birds that lost this critical rest stop on their migratory routes due to urbanization. There have been close to 300 species of birds observed here. Wonder what they think of the airplanes? It was windy and rainy here today, I think the correct term is "blustery". I can say I heard a Blackbird and saw a juvenile eagle being buzzed by a couple of annoyed crows. There were lots of ducks in the waters surrounding the jetty as well. The usual seagulls playing the wind currents are always fun to watch. There are beaches, walking trails, observation towers, and restroom facilities here. Easy access for any fitness level. And lots of airplane traffic to and from the airport to watch. In case you get bored watching the eagles.